(CNN) -- David Beckham's hopes of crowning his stellar professional football career with one final World Cup appearance this year ended Monday as he underwent surgery on his Achilles tendon. Beckham's global popularity, particularly with American fans, would have been a huge spectator draw for the 2010 showpiece in South Africa. But he was forced to hobble from the pitch while playing a league game for his Italian team AC Milan. Finnish orthopedic surgeon Sakari Orava operated Monday on Beckham and told CNN affiliate MTV3 in Finland the injury was a total rupture of the player's left Achilles tendon. "I think the surgery went fine," Orava said, adding that Beckham would miss the World Cup starting in June. "Healing will take much longer." Beckham flew in Monday to receive treatment from Orava at a private hospital in Turku, some 250 kilometers (155 miles) west of Helsinki. MTV3 journalist Mervi Kallio said the surgeon told her Beckham "probably knew there was no chance he could play [in the World Cup] when he arrived." How serious is Beckham's injury? Earlier in the day, England national team boss Fabio Capello expressed his sympathy for the star midfielder. "I am very sad for David that he has suffered this injury," he said in a statement. "David is a great professional and has worked very hard to be ready for the World Cup, so missing it will be a big blow." What does Beckham's injury mean to the World Cup? In a message posted his own Web site, Beckham had said he was on his way to Finland to see a specialist and was optimistic of a rapid return to the pitch. "I am upset but want to thank everyone for their messages of support," he said. "I hope to make a swift and full recovery." Beckham's inclusion in the line-up for South Africa, albeit less crucial than younger stars such as Wayne Rooney, would have made him the country's first ever player to compete in four World Cups. His injury occurred late on during Sunday's game against Serie A league opponents Chievo, as the apparent tendon rupture caused the midfielder to pull up while attempting to kick the ball, pain visible on his face. The 34-year-old, who is on loan to Milan from U.S. team Los Angeles Galaxy, attempted to play on but quickly realized his injury was too serious, at which point he crumpled to his knees, face down on the pitch. Depending on the severity, Achilles ruptures -- a tearing of the tissue connecting the heel to lower leg muscles -- can take months to heal, with physiotherapists advising weeks of rest before resuming even light exercise. "If it is an Achilles, then it's very serious. He could be out action for 5 to 6 months before he returns to playing, much longer before he's match fit," Sammy Margo, English football's first female physiotherapist, told CNN. While the selection of Beckham, a regular in the England side since 1996, for the World Cup was far from guaranteed, it will be a confidence blow to a team that has been rocked by recent scandals over players' private lives. It will also cast a further dent Beckham's status as the most recognizable -- and most bankable -- football player on the planet, a position already beleaguered by disappointing performances and the rise of younger contemporaries. 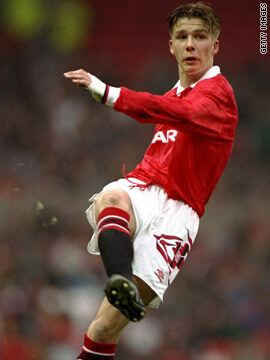 But Beckham has battled against adversity in the past. In April 2002, he broke a metatarsal bone in his left foot, but recovered in time to join the England side that was eventually knocked out in the quarter finals. The former Manchester United player's soccer success has also been mirrored by his life off the pitch. He and his wife, former Spice Girl Victoria, regularly rub shoulders with Hollywood A-listers, counting Tom Cruise among many celebrity friends. While he commands enormous sums for his sporting skills, he also earns big cash as a brand-name style icon and has put his name to his own range of cosmetics. Says Stephen Cheliotis of market analysts Superbrands, Beckham's likely World Cup sidelining is unlikely to harm his highly profitable image, in contrast to the recent turmoil that has hit golfer Tiger Woods. "You could even argue that with not going to the World Cup, there's less risk to his brand," he told CNN. "There's no chance of him playing badly."